Strike a woman, strike A WOMAN! - Activate! You are here: Home / Strike a woman, strike A WOMAN! Strike a woman, strike A WOMAN! 2017-11-09 /0 Comments/in Activator Opinions /by Activate! I remember that day vividly! It was the Sunday after Module 2 and a fellow Activator lady and I were walking from the Shoprite that’s at Adderley Street, Cape Town, to meet the rest of the group at the Company Gardens. We shared about our lives as we walked… at some point, we spoke about the issue of womaning; I think it was in reference to the topics discussed during our ActivaTEDtalks the previous day. Two strong black female leaders, academics at that, talking in the safety of mutual understanding… she said something that stayed with me to this day. She said, “Everyone kept on saying that I should be strong when uMama (her grandmother) passed away. But I wasn’t okay! I couldn’t be strong… I am not a rock. I’m not even supposed to be a rock…” and this reminded me of the words Casca had said during one of the sessions, I think it was at the same ActivaTEDtalks session… he said, and I quote, “The struggle of women is unnecessary. Women shouldn’t have to struggle. Men must stop subjecting women to an unnecessary struggle…” these two statements are the anchor that holds this article. No human being is, in fact, born hard. We are all born fragile and vulnerable; every touch can literally make or break us. Equally so, no woman is innately a rock. Something happens to the woman which hardens and subjects her to a rocky status. 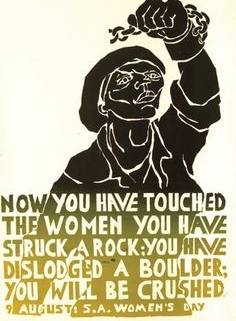 The famous saying, Wathint’ umfazi wathint’ imbokodo, proves this point… because, as it translates, it is when a woman is struck that she then becomes a rock. Hardness is a response to a hit, a strike, from people and situations. It is rather unfortunate that the very unnecessary striking of women has become so normal in society that we have acquainted ourselves with hardness that we even celebrate it as strength. When, in actual fact, these rocks are merely tombstones that serve as reminders of what was once a strong woman. Whatever you believe, it is a universal truth that every living thing was created as it is because it can only serve its purpose best in that specific form… the birds, bees, lions, monkeys, and even plants; everything in nature is structured exactly how it must be to function optimally in itself and in relation to other created things. The same is true for women. Women are not tender and nurturing by accident, it is in a woman’s nature to be “soft”. Forcing a woman to go against her natural need to love and care, to birth and build, thus goes against the natural working of things. In short, subjecting women to rocky states robs society of the role that women are meant to play. That woman who has to work twice as hard to progress has to sacrifice the time she could have used to raise her children in efforts to provide for them. Equally, women were never meant to father their children, it is the strike of absent fathers that hardens women to a point being able to raise their children on their own. Their ability to do so should, however, not be seen as an invitation to keep on striking women into single motherhood. While there is nothing wrong with celebrating the strength of women, there is certainly no reason to subject women to situations that force them to be strong, unnecessarily so. Should there be something that strikes a woman into rock mode; society should not banish her into the Stone Age for the rest of her life. Instead, we should strive to help women heal from the generations of oppression and hurt. We should create safe spaces for women to work through their pain and reclaim the true strength that lies in their ability to build and nurture. It is good and well to celebrate Amaqhawekazi, but we must be careful not to create the misconception that women can take violence and oppression. Women have taken injustices for way too long, we must now actively look at ways to facilitate healing for women while socialising men to stop subjecting women to unnecessary struggles. What part will you play? All abuse is unnecessary, we can actually live without it, and we should. Every day should be a Day of Activism against the very UNNECESSARY Abuse of Women and build a society where women are not rocks. And if you are a man, make it a point that you educate other men to respect and protect women – if you don’t strike her, she will never have to become a rock. https://www.activateleadership.co.za/wp-content/uploads/2017/11/48770e229f66dd0464dd4f8746758dd1-protest-posters-protest-art.jpg 343 236 Activate! 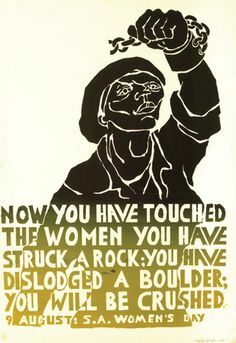 https://www.activateleadership.co.za/wp-content/uploads/2018/09/logo.png Activate!2017-11-09 10:58:202018-08-13 12:44:33Strike a woman, strike A WOMAN!